Full disclosure before I get into this review: James Cameron is my favorite filmmaker of all time. He’s been so since I first saw Terminator and Aliens as a kid, and he was cemented as such when I saw Titanic as a teenager. That said, I have no problem criticizing his work when its deserved. For example, I was not a big fan of Avatar, and I had no problems letting my disappointment be known. Mind you, it was mostly because I had read the script treatment like ten years before the film came out and I felt the final product wasn’t as good, but also, modern Cameron is somewhat different from the director who made all those R science fiction films of the 80s. As a die hard Cameron fan, I’ve known about his desire to make a film based on the manga Battle Angel Alita for a long time. It was supposed to be his next project after Avatar, but then that movie became the highest grossing film of all time and Cameron decided he had more stories to tell on Pandora. Now there are like 3 or 4 more Avatar films in development and so the prospect of ever getting a Battle Angel film didn’t look too hopeful. This left me pretty disappointed because, like I said, I wasn’t hot on Avatar, and while I had never read the manga, or seen the anime adaption, something about Battle Angel felt like it would play to Cameron’s strengths and might even bring out the qualities I loved in his earlier work. Mr. Cameron must have realized all of this, which is why he decided to call in the assistance of another favorite director of mine, Robert Rodriguez (Sin City, Planet Terror), to helm the film, working off a screenplay written by Cameron. When the trailers started hitting I was interested in what I saw, but I wasn’t completely sold on the digital effects used to create the lead character, and I feared the movie might end up being a mindless CGI fest. Still, I always try to give things a chance before making passing judgment, and if nothing else, Alita was sure to be a nice change of pace from the endless stream of bland superhero flicks and uninspired remakes flooding Hollywood these days. Well, I’m happy to report that not only does Alita: Battle Angel not disappoint, it serves as a reminder of how good original sci-fi stories can be. The powerhouse combo of director Robert Rodriguez and producer/writer James Cameron proves to be a successful one, and together with the special effects wizards behind Avatar they bring to life Yukito Kishiro‘s manga in all of its glory. The film tells the story of a cyborg girl with a human brain who falls from an upper class sky city down to the poor scrapheap below. She bonds with humans while discovering her mysterious warrior past. It has all the familiar cyberpunk trappings, and even calls to mind some recent films like Elysium and Ready Player One, but in the much more capable hands of Rodriguez and Cameron, this seems like the definitive source material all those other movies must have been inspired by (maybe they were?). 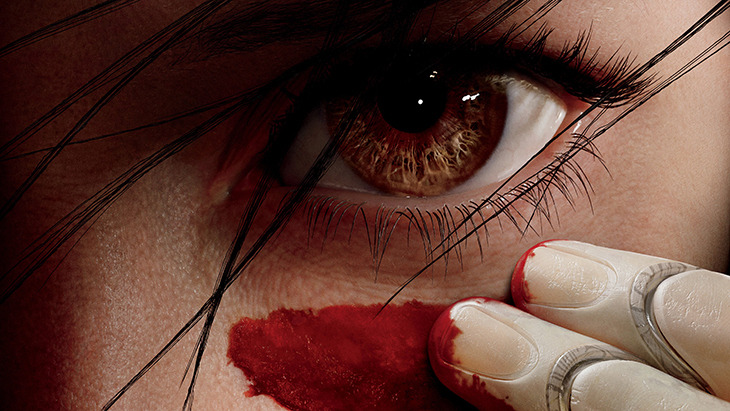 From cyber surgeons, to cyborg bounty hunters, to a futuristic roller derby sport called motorball, Alita offers an immersive world, amazing visuals, genuine thrills, and most importantly, it remembers to give its lead character enough personality and soul that you’re actually invested the whole way through. 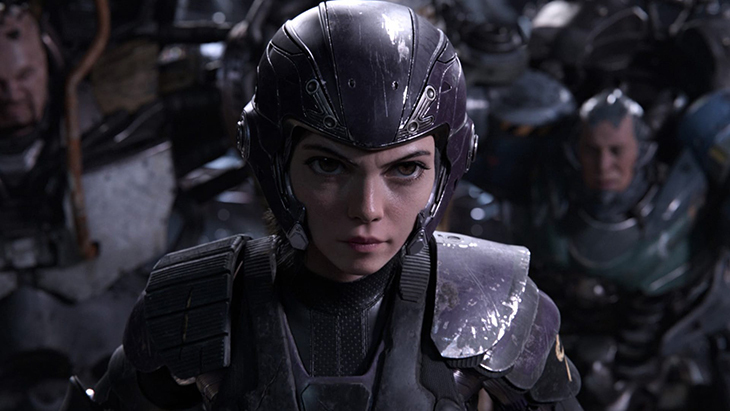 Rosa Salazar‘s motion capture performance comes through clearly, bringing out both the innocence and badassery of the Alita character. The film does a great job balancing ample world building with spectacular action sequences that are well choreographed and epically shot. All of this combines to make Alita one of the most entertaining sci-fi action films since 1999’s The Matrix. It doesn’t quite stick the landing though. The final act tries to do too many things too quickly, and as a result, the romantic moments fall flat, and the ending feels a bit rushed and contrived. It’s something a longer cut might have improved, but even if that’s not possible, the majority of the film and its last scene does more than enough to leave you satisfied and ready for more. I really hope the film does well enough that we get to see the story continue in future sequels. I give this one my full recommendation. In my opinion, Alita: Battle Angel is the best anime inspired movie to date and will hopefully open the door for future anime adaptions as well. See it on the largest screen you can and shell out for the 3D. You will not be disappointed.